Oriental bittersweet, Celastrus orbiculatus, is native to eastern Asia and was planted in North America for ornamental uses as early as 1736. The vines are easily propagated, grow vigorously up to 60′ and 6″ in diameter in a wide range of environmental conditions and produce attractive fruit that has been used by the cut-flower and craft industries. 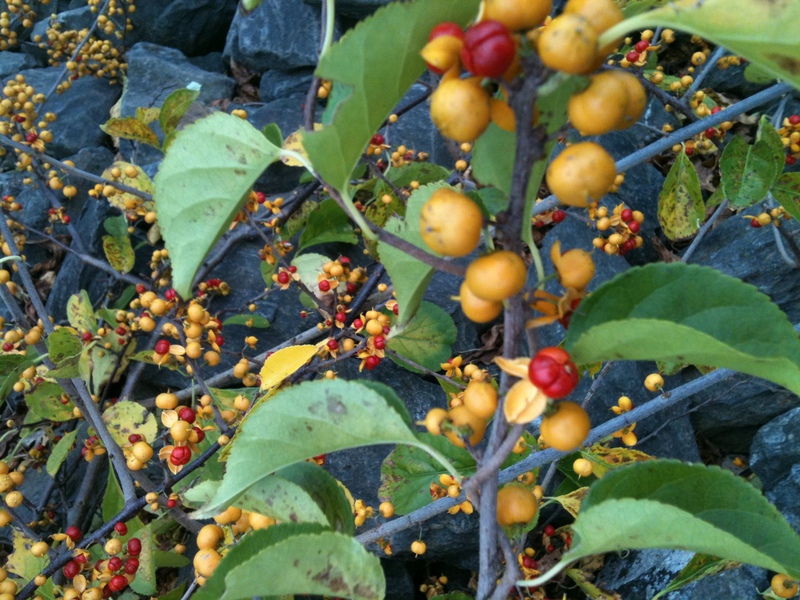 American bittersweet, Celastrus scandens, is native to much of the temperate United States. American bittersweet vines are also vigorous but are much better behaved and produce larger and showier fruits. Both species have separate male and female plants and produce flowers, but only female plants produce fruit. The species are easily distinguished by fruit (female plants) and flower placement (male and female plants) at the leaf axils of Oriental bittersweet versus only at the terminal ends of American bittersweet. Fruit capsule color is another distinguishing trait. Oriental bittersweet has yellow fruit capsules and American has bright orange capsules. Ecological Threat: Invades forests, woodlands, hedge rows, fields, and established prairies. Oriental bittersweet management in the forest will likely involve either a foliar spray (spraying the leaves), cut stump (cutting the vine and treating the cut stump) or basal bark herbicide treatment (using an herbicide mixed with bark oil that will penetrate the bark). For large infestations please contact the MDA (information below) before proceeding with treatment. Small vines can be pulled and bagged or burned. It is important to note when pulling that these vines can root where they touch the ground, not just at the roots, so pulling them and tossing the vines on the ground will not kill the plant. The vines should be treated with an herbicide, bagged and/or burned. NOTE: Burning live Oriental bittersweet in an effort to kill it, like in a prescribed burn for forest or prairie management, will not kill Oriental bittersweet. It will instead lead to a new flush of vigorous growth. Arsenal and Stalker chemicals have been shown to work the best.